This article is about the toy in the Mario vs. Donkey Kong series. For the form of Peach seen in Mario Party 4 and the small form of Peach seen in Super Mario Bros. 2, Super Mario 3D World, and in post-Fall 2017 versions of Super Mario Run, see Mini Mario (form) and Small Mario. The Mini Peach toy, as first seen in Mario vs. Donkey Kong 2: March of the Minis. Mini Peach (also known as Mini Princess in Mario vs. Donkey Kong: Mini-Land Mayhem!) is a toy resembling Princess Peach that is sold by the Mario Toy Company. These wind-up toys made their debut in Mario vs. Donkey Kong 2: March of the Minis, and have then returned in every subsequent installation in the Mario vs. Donkey Kong series. Mini Peaches, alongside Mini Yoshis, Mini Luigis, Mini Bowsers, Mini Rosalinas, Mini Diddy Kongs, and Mini Bowser Jr.s don't have their real counterparts in the Mario vs. Donkey Kong series. 1.2 Mario vs. Donkey Kong: Minis March Again! 1.3 Mario vs. Donkey Kong: Mini-Land Mayhem! In Mario vs. Donkey Kong 2: March of the Minis the success of the Mario Toy Company from its Mini Mario toys was so good that it allowed them to expand to sell other Mini toys, including Mini Toad, Mini Donkey Kong, and Mini Peach toys. Mini Peach toys do not appear in the main campaign, but players can unlock the Mini Peach toys in the Construction Zone by beating the minigames for worlds four, five, and six. This allows access to Special Kit 2, which contain the toys as well as most of the features in the game up to the sixth floor of the main story. The Mini Peach toys return in Mario vs. Donkey Kong: Minis March Again!. In this game, the Mini Peach toys are added to the Construction Zone after completing rooftop levels 4, 5 and 6 (which are available after beating level 4-DK). Upon filling this condition, they can also be selected to be used in any main level besides key, DK and Rooftop levels in the Showroom of the option menu. There is also a "Minis" option (unlocked by beating rooftop levels 10, 11, and 12), which allows all four Mini toys to be in a level of the main campaign at the same time. Mini Peach toys can be featured in any level with three or more minis. The Mini Peach toys, called Mini Princesses in this game, return in the Mario vs. Donkey Kong series for a third time in Mario vs. Donkey Kong: Mini-Land Mayhem!, where they aid Mario's quest to rescue Pauline. Starting in Teatime Twirl, they appear in the fourth level in every world. They have a pink door which they must be taken to in order to complete the level. However, they are stuck in a capsule at the beginning of a level, which must be touched by another mini to break it. In Plus Mode, they start to appear in normal levels, where they must be taken to the door in the right order along with the other mini toys. Mini Peaches are always the third type of mini to go through the door, as they were the third one introduced. Aside from this restriction, they still act the same in the fourth levels of those worlds. They can be unlocked for use in the Construction Zone in Multi Door levels after beating Teatime Twirl, and are unlocked for other levels after creating 49 levels. The Mini Peach toys return for Mario and Donkey Kong: Minis on the Move, available for any level after unlocking Puzzle Palace. A Mini Peach can also be unlocked for display in the toy collection by obtaining 20 Stars in the main game. 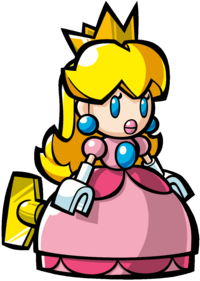 Mini Peach's appearance in Mario vs. Donkey Kong: Tipping Stars. Mini Peaches reappear once again in Mario vs. Donkey Kong: Tipping Stars. They act the same as in all the other games; they have to be taken to the goal door along with other Mini toys. In the main game, they first appear in Rolling Hills in the first Multi-Door level of the game, Level 1-4. They are stuck in a capsule at the beginning of the level, and they need to be freed and taken to their own door. They appear in many other levels, though unlike Mini Land Mayhem!, this is not limited to Multi-Door levels. They also appear in most of the Bonus levels. In the Workshop, they must be bought for 50 stars in the Swirling Courtyard section of the Workshop Store in order to be used in custom levels. Mini Peach in Mini Mario & Friends: amiibo Challenge. Mini Peach reappears in the game Mini Mario & Friends: amiibo Challenge. She is unlocked when the player uses a Peach amiibo. 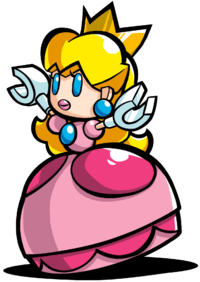 As every character, besides the Mini Spek, Mini Peach has an unique special ability which she can float in the air for some seconds, enabling her to cross gaps that otherwise are impossible for other Minis to do by themselves. The ability is a clear reference of Princess Peach's float ability seen in other games such as Super Mario Bros. 2, the Super Smash Bros. series and Super Mario 3D World. This page was last edited on August 17, 2018, at 12:30.